23 year old Riza Santos from Calgary was crowned Miss World Canada 2011 in a beauty pageant held on May 19 in Richmond, BC. 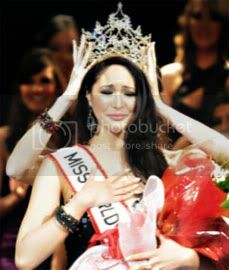 She was crowned by Denise Garrido, Miss World Canada 2010. Riza competed in Miss Earth 2006. She also participated in Pinoy Big Brother Celebrity Edition in the Philippines. Santos has completed training courses with the Canadian Forces. She will represent Canada in Miss World 2011 beauty contest on November 6 in London, UK.